Inder Loves Folk Art: Equinox. I have a tiny new niece! Her name is Augustine. She was born in the early hours of yesterday morning, after a very short labor. 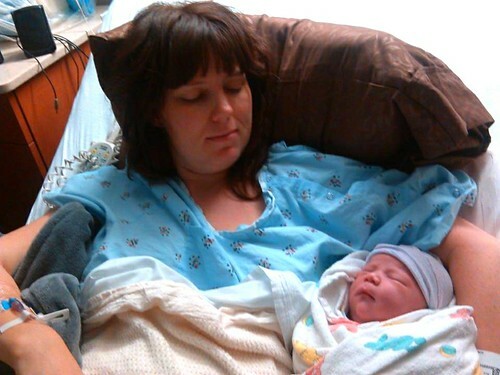 She was born in triage, and the doctor didn't make it in time to catch the baby! The nurse was like "okay, let me check you ... whoa! THE HEAD IS OUT!" When this girl decides to do something, she does it immediately and expeditiously! Augustine is pink and healthy, and my sister is a superstar. I'm calling her Augie for short. Others are calling her Gussie. We'll see what sticks. Right after Augie was born, we had sudden heavy rain. This is the earliest heavy rain I have seen in many years. (My part of California has long dry/cool summers and mild wet winters - sometimes we don't get a single drop of rain for six months. The rain usually starts in mid to late October.) My midwife told me that changes in barometric pressure can bring on labor, so maybe that had something to do with baby Augie joining us on this wet morning! 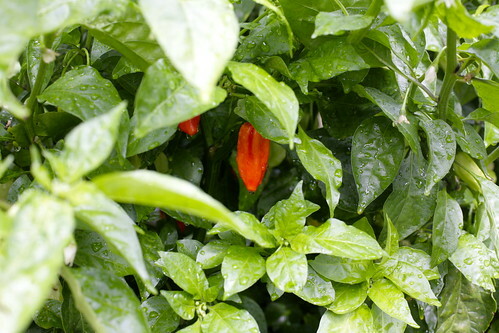 This beautiful pepper is the notoriously spicy "ghost pepper." I love to look at them, but I'm afraid to even touch them lest I get burned! 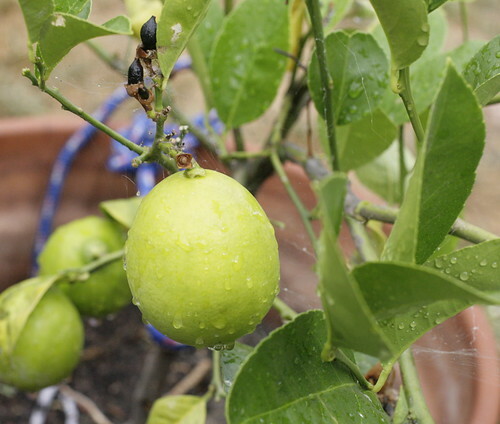 It looks like our tiny lemon tree will give us a few lemons this winter! The autumnal equinox is always a little bittersweet for me. I love autumn - the pretty sunsets, the fall colors, the abundant produce at the farmers' market. But you won't be surprised to hear that I don't love driving home from work after dark, dreary weather, high energy bills, and catching every cold. But just like the shortening days and cooler weather signals the tomato plants to set fruit and the trees to drop their leaves, the changing seasons seem to send my thoughts towards warm soups, good books, and warm blankets. Put another way: Cooler weather + a new baby in the family = a new quilt. So after visiting my sister and baby Augie at the hospital, I came home and started cutting strips and scribbling notes. 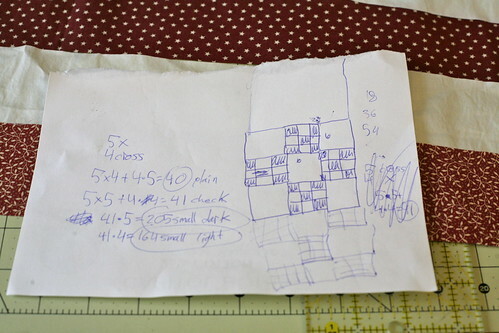 Harpal helped me calculate how many pieces I would need to effectuate my design. He is my go-to for quilt math problems. I like to think I could figure these things out on my own, no problem, but I know he enjoys a good puzzle, so I let him help. It's a good arrangement. We both enjoy the process. 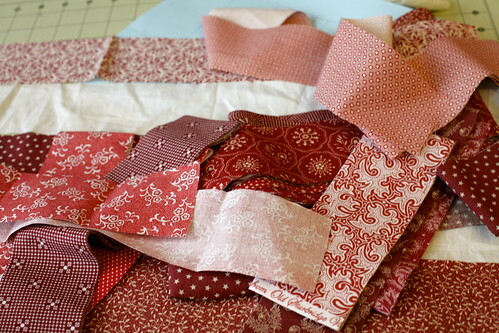 Then I started a little strip piecing assembly line. 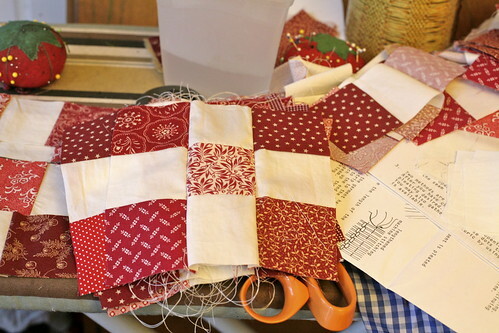 There is something about the tedious, repetitive task of piecing a quilt that really appeals to me at times. I love watching the blocks pile up and seeing my idea take shape. 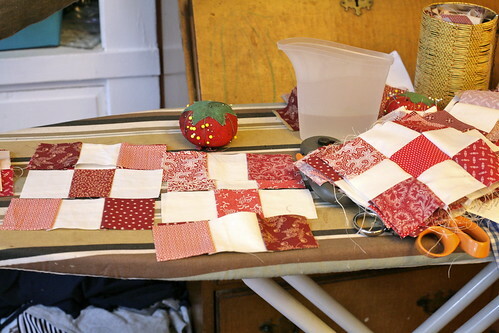 A red and cream quilt ... it's very autumnal, isn't it? Augie is a great nickname! And the colours of your quilt almost make me think of Christmas. Very cosy. i think your sister resembles you, no? congrats on baby augustine! even though i was a finance major, sewing math sometimes makes me cross-eyed. maybe i can blame that on sleep deprivation? a perfect, homey, autumnal, cozy quilt! well done! Better late than never: Rayon Gathered Skirt. Selfish Sewing Week: The Bess Top. Joe's first day back at preschool!